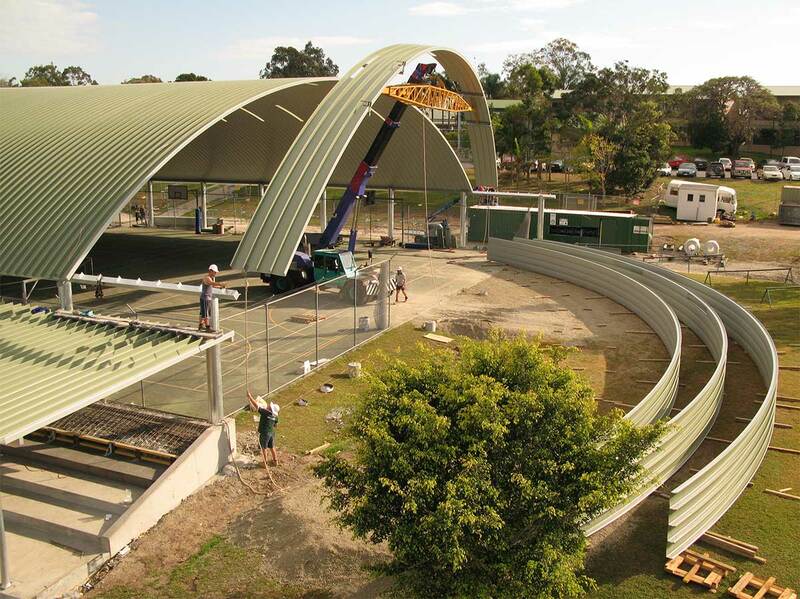 Spantech is the Australian based construction company that developed the patented Spantech Construction System, a revolutionary roofing system used to construct distinctive wide-span curved-roofed buildings. We have extensive experience in the design and construction of buildings for: Education, Sports and Aquatic Centres, Defence, Bulk Storage Facilities for Agriculture and Mining and other Commercial buildings. Spantech has operated successfully for over thirty years in Australia and New Zealand. Our technology is also available in Malaysia and the UAE through our trusted international licensees. The Spantech Construction System features a unique wide span curved roof panels. The panel can span self-supported up to 40m wide. The result is a dynamic frameless wide-span building. Quonset-style buildings are also constructed with the same curved panels. The system also includes a complimentary straight panel. The straight panel can construct pitched roofs and walls. Spantech panels are manufactured on site. It makes construction fast and efficient. Refer to the Technical Data for more information. The Spantech Construction System is versatile, very strong, environmentally efficient and cost effective. It is most economical when applied to large commercial projects. A diverse array of projects use Spantech’s technology . The range stretches from simple shade structures to complete indoor sports and aquatic centres. The company also offers a comprehensive range of hardened earth-covered buildings specifically designed for the Defence sector.